Pauls Hairdressing for Men is more than a barber shop. It’s a men’s grooming salon; where services include everything from a basic haircut to complete restyles. All our stylists are trained in mens hairdressing, including traditional barbering skills. So, whether you want just a haircut or a full consultation, our stylists will be happy to oblige. A full range of treatments are available. We also have an extensive retail range of made-for-men products. 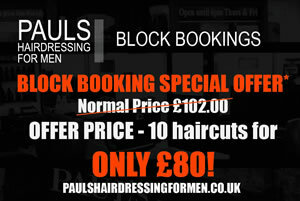 Pauls Hairdressing For Men from RichR32 on Vimeo. Appointments can be made for children under 5 years old. Gift Vouchers & Childs First Haircut Certificates are available.